God invites us into a relationship. It is a relationship to be nurtured and celebrated. God does for the people because God loves them. Now how does our service reflect God’s goodness? 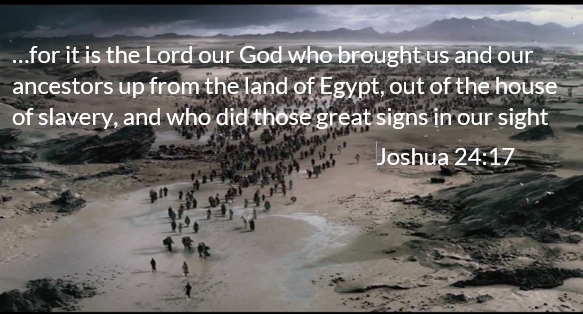 The Israelites have now, at long last, arrived and settled in the land which had been promised to their wandering ancestors. It was God who brought them through it all and delivered on the divine side of the covenant. Now it’s the people’s turn to choose where their loyalties lie. How are leaders in your community chosen? What might it look like to trust in God rather than trusting in people? What covenants or agreements have you made with God? Are these healthy (commitment to follow) or unhealthy (bargaining) agreements? PRAY: God, you bring us safely through all the trials and dangers of our lives. Keep us mindful and make us joyful to praise you with grateful hearts. In the name of Jesus. Amen. BLESS: God of grace, your word inspires our faith. Speak so that we may clearly see the options we face and have wisdom to choose those that draw us to you. Amen.